Tutorial about how to consuming REST API using Ionic 2 Mobile App with standard Angular HTTP client. That REST server run with MongoDB, for that you have prepared and install MongoDB first. If you like to use external REST web service, this is one of them JSONPlaceholder. If you are using newer Ionic 3 and Angular 4.3, you find the tutorial of Accessing REST API using Angular 4.3 HttpClient. Almost all of our tutorial starting with new project creation. So, open your terminal or cmd then go to your projects folder. Type this command. This command will create new App with the name 'IonicRestCall'. Go to this newly created folder. Always test the newly created project to make sure there is no error in the current environment. Next, we have to make a service or provider file for implement REST call. For that, just type this command. Open that newly generated provider file using your text editor or IDE. Generated class for the Restapi provider. for more info on providers and Angular 2 DI. As you can see, default generated provider is using Angular HTTP client which already injected to the constructor. Next, register this service in 'app.module.ts'. Open and edit 'app.module.ts' then add this import. Then add in provider @NgModule. Now, it's time to make a REST API call from provider file. To make this practice simpler, we will use existing free REST API for testing on the Internet. For Edit provider file then declare REST URL variable below class name. Create function for getting users data. That getUser function will check if data already loaded then return existing data. Otherwise, it will load new data and resolve to Promise. Now, it's time to use service from the controller. For this example, we will access data from REST API on the home page. Open and edit app/pages/home/home.ts then add this import. Inject this service in the constructor. Declare the variable to hold data below class name. Create new function for call the service. Call this function from constructor. To displaying data in the view, open and edit app/pages/home/home.html then replace tags inside ion-content tag with this tags. 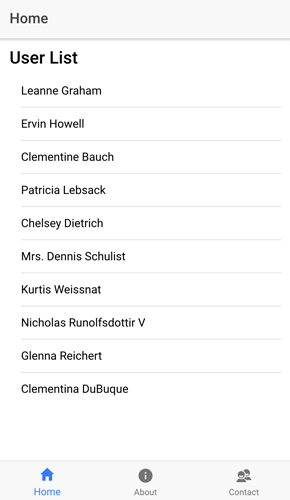 Now, run the app then view in the browser and you will see the list of users like below. After we successfully get a list of the user, now we trying to save new user to the REST API. We can use generated about page for creating user form. Open and edit app/pages/about/about.html then replace all tags inside ion-content tag with this. Create a new function in 'restapi-service.ts' to post new user. Open and edit app/providers/restapi-service then add this function. Call that post service from the controller. But first, declare model variable form the form or data that will be posted to REST API. Don't forget to import and inject RestapiService. Create function for save data. Then restart your Ionic 2 app. Open in the browser then test save data. For put and delete have the same function with the post. And that it's for the basic, next time we will cover more deeply about consuming REST API in Ionic 2 Mobile App. You can get the full source code in my Github. Finally, we need your suggestion to improve this article. Please put your suggestion in the comment below.